Welcome to the home page of Artword Theatre's archive site gateway. Artword is the creative team of Ronald Weihs, director and playwright, and Judith Sandiford, designer, artist, manager. We have produced original theatre since 1993. From 1993 to 2006 we also operated a facility (Artword Theatre and Artword Gallery) at 75 Portland Street in downtown Toronto Canada. In 2007 we relocated to Hamilton, where Artword Theatre continues to create, produce and tour theatre. In 2009 we launched our cafe-bar Artword Artbar in Hamilton. See the links below for our projects since 2007.
live music, performance, theatre. What's On Now: Artword Artbar. Fri July 3, 2009 at 8 pm, Sat July 4 at 3 and 8 pm Tobacco Troubadour Artword on the road! Three shows in the heartland of tobacco country: Fri & Sat, July 3 & 4, 2009 at the Backstage Capitol Theatre 93 King St., Delhi, Ontario, 519-582-7272. Sat June 27, 2009 at 8 pm "New Dance, New Music" Artword Theatre presents a one-night festival of performance adventure. New dance, new music collaborations and improvisations, at The Pearl Company, 16 Steven Street, Hamilton $10. Sat May 23, 2009 at 8 pm "Theatre +..." a theatrical double-bill, at The Pearl Company, 16 Steven Street, Hamilton $10. "One Night, the Rain", a theatrical adaptation of a short story "Maria dos Prazeres" by G.G. Marquez. Artword Theatre presents"Langston Hughes vs Joe McCarthy". Is poetry subversive? In 1953 U.S. Senator Joe McCarthy thought so. Directed by Ronald Weihs, this reading is based on testimony and the poems of Langston Hughes. 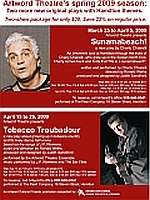 April 15 to 26, 2009 Tobacco Troubadour, a new show based on the songs of musician J.P. Riemens, with script by Ronald Weihs, about growing up in tobacco country and its lively dance hall scene. Supported by The Ontario Arts Council. February 12 to 22, 2009 Rascals and Numskulls a musical entertainment about the thrilling adventures of Robert Land, Hamilton's first white settler after the American Revolution. Written and directed by Ronald Weihs, performed by the Artword Theatre Ensemble, music by Gary Santucci. Fri Feb 27, 2009 at 8 pm "Langston Hughes vs. Joe McCarthy" Artword Theatre presents a dramatic reading for Black History Month. With members of the Artword Theatre Ensemble, at The Pearl Company. BACK December 4 to 7, 2008 ! The critics and audiences loved the show so we're bringing it back for four shows. You Are What You Do an original musical play celebrating the lives of working people, written and directed by Ronald Weihs. A theatrical collage of stories gathered from men and women about how work has shaped their lives. Thurs to Sat at 7:30, Sun at 2:00 pm, at The Pearl Company,16 Steven Street, Hamilton. Artword 2008-2009 season launch Sat Sept 13 at 8 pm at The Pearl Company, 16 Steven Street, Hamilton. Our recent hit If Cows Could Fly has been invited to the 2008 Ashkenaz Festival in Toronto, Sun Aug 31 at 1:30 and Mon Sept 1 at 5 pm. in the Studio Theatre, Harbourfront Centre, $15 advance, $18 day of. Harbourfront Box Office 416-973-4000 If Cows Could Fly is a musical play, written and performed by Allan Merovitz, directed by Ronald Weihs, about growing up Jewish in the Ottawa Valley, with an on-stage Klezmer band (Henri Oppenheim accordion, Frank Rackow clarinet and Ronald Weihs fiddle). If Cows Could Fly also runs one night in Hamilton at Beth Jacob Synagogue, 375 Aberdeen Avenue, on Thurs August 28 at 7 pm Regular: $25, students under 18 and children: $10, 905-522-1351. March 2008: Rave reviews for Cows! Thank you, Ottawa! The reviewers loved our show (see If Cows Could Fly) The audiences came out in large numbers, despite the worst blizzard in decades on our final weekend (March 8, 9). Wow! February 21 to March 9, 2008 in Ottawa If Cows Could Fly Artword remounts an Artword favourite, two days in Hamilton and a three-week run in Ottawa at the new Irving Greenberg Theatre Centre mainspace. If Cows Could Fly is a musical play about growing up Jewish in the Ottawa Valley, written and performed by Allan Merovitz, with an onstage Klezmer band. Ghost Ship Artword mounts a new workshop production about the Senegalese migrants to Europe. Directed by Ronald Weihs, script by Judith Sandiford and Ronald Weihs, music direction and performance by Waleed Abdulhamid, performed by Seifu Belachew, Muoi Nene, Alexandra Semakula, Stella Umeh. At Trane Studio, 964 Bathurst St. Toronto. Funded by the Ontario Arts Council. We bought a neighbourhood bar in the James North arts district of Hamilton and have turrned it into an arts hub and live music venue. 1993-2006: Artword's website of all activity at 81 and 75 Portland facility (it was a busy place!) You can the Artword archive. Artword Theatre's own productions, directed and/or written by Ronald Weihs, designed by Judith Sandiford.